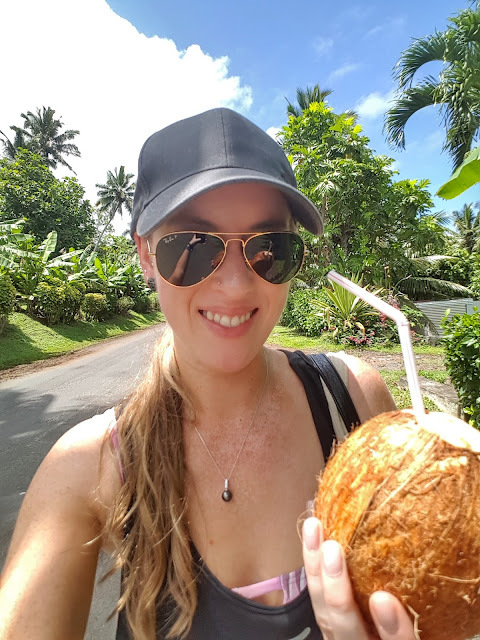 I’m back fresh from my week in Rarotonga and I couldn’t wait to start writing. As well as a travel diary and hotel review – one thing I particularly wanted to write about was the food! 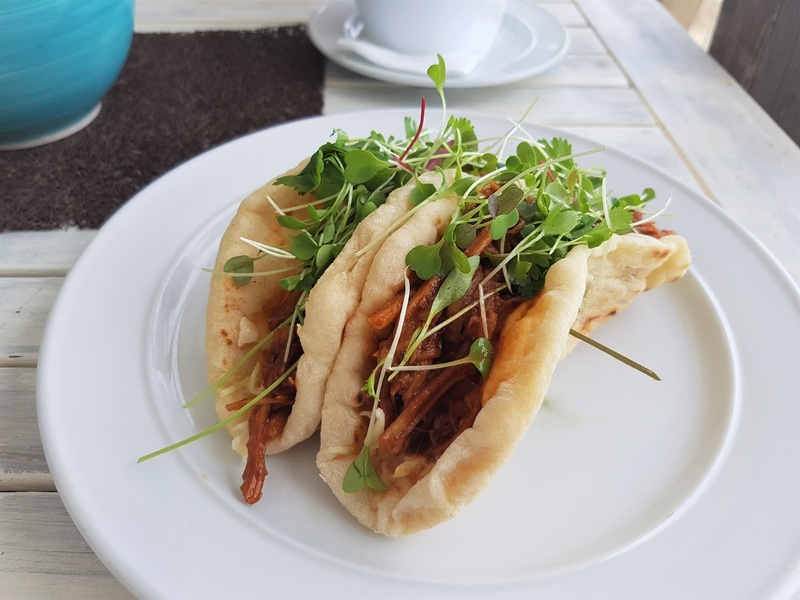 I am starting ‘Food’/ ‘Best Places to Eat’ as a new category on my blog as I am such a big foodie and I always love reading other people’s suggestions of where to eat too. Muri is one of the top places to stay in Rarotonga – with a stunning crystal clear aqua lagoon hugging the white sandy beach, many great accommodation options, activities and of course a fantastic selection of restaurant and cafe choices! I’ll start with The Pacific Resort, where I was staying at as I ate there quite a lot. 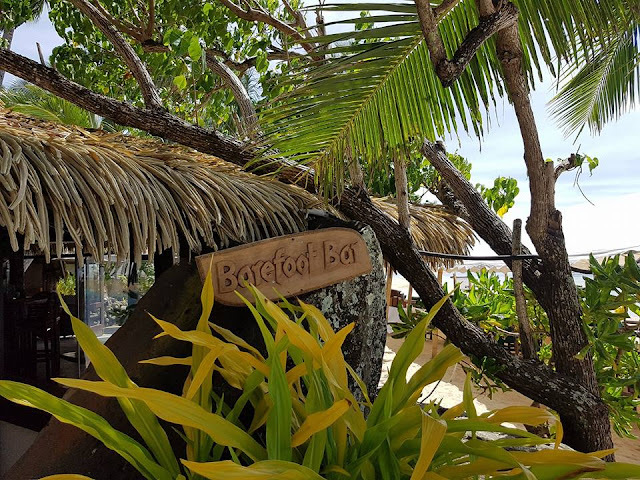 ‘Barefoot Bar’ is located right on the beach and you can enjoy a range of different drinks with a superb view. They go from 4 – 5 pm and 8:30 – 9:30 pm. Certain cocktails go for $10 and beers come down to $5 (both almost half price). ‘Sandals’ is their restaurant and like the bar, you don’t have to be a guest to eat there, but bookings are recommended. My very first dinner there I ordered the ‘Fish of the Day’- and I think that was the best fish I’ve ever had in my life! 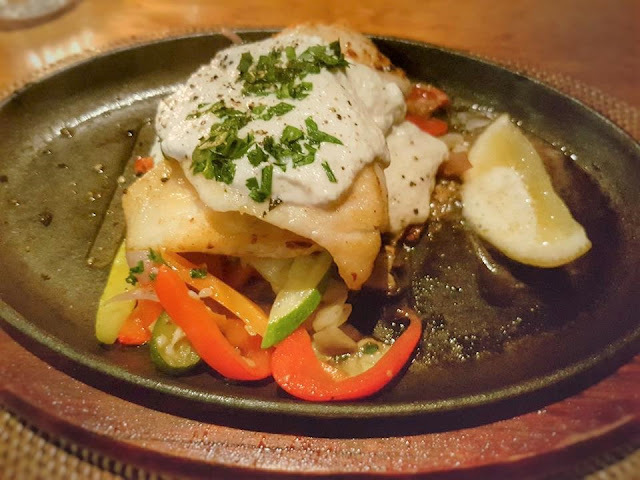 (I’m going to mention fish quite a lot in this post because it’s their top local food and OH so good!). It was Yellow Fin Tuna which I had grilled and it was per-fec-tion. It came with a nice fresh salad and you could choose any other side you wanted with it, I had the roasted vegetables. Everything was fantastic – I devoured it! For $28 NZD it was really great. (I didn’t take a picture of it as I was eating with my family and forgot). Later in the week, we decided to have dinner there again as it was pouring with rain and we didn’t want to venture too far. We hadn’t booked and they were full up, but they let us eat at the bar which was fine as it was still a nice table but with a view overlooking the beach. 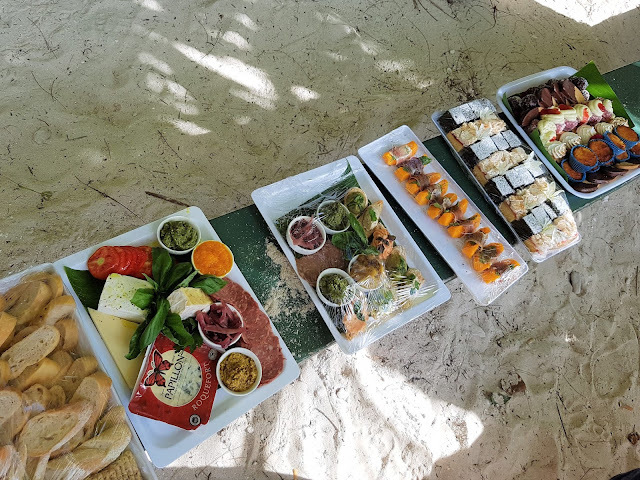 By then we had tried Ika Mata a few times before (Rarotongan raw fish salad) and loved it – but we discovered the Pacific Resort was the absolute master of it. It was so incredibly zingy, tasty and fresh – we were fighting over it at the end! 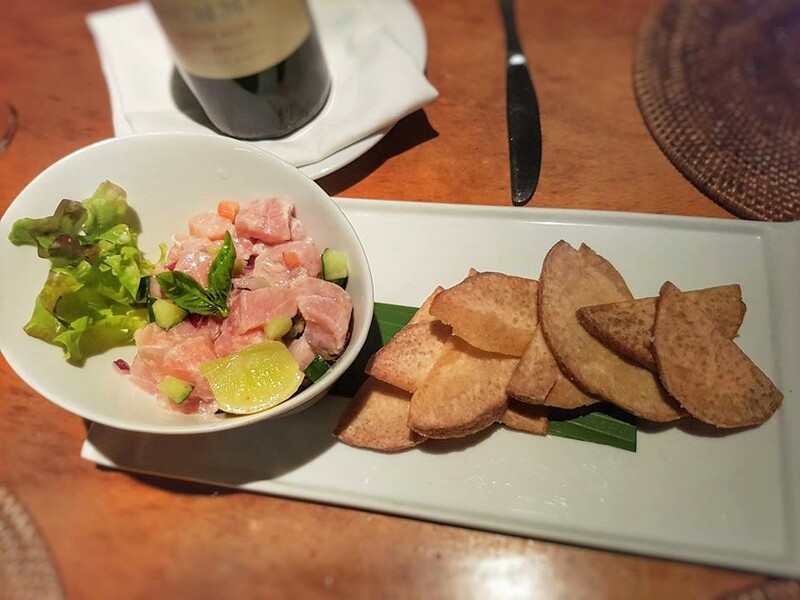 It also came with a side of crispy taro chips – another local fave. As my main, I had the ‘Chef’s Special’ which was a sizzling hot plate of fish and vegetables. Again, it was cooked so well and the coconuty sauce on top was so creamy and delicious. The fish changes daily depending on their catch of the day – this one was Parrot Fish. 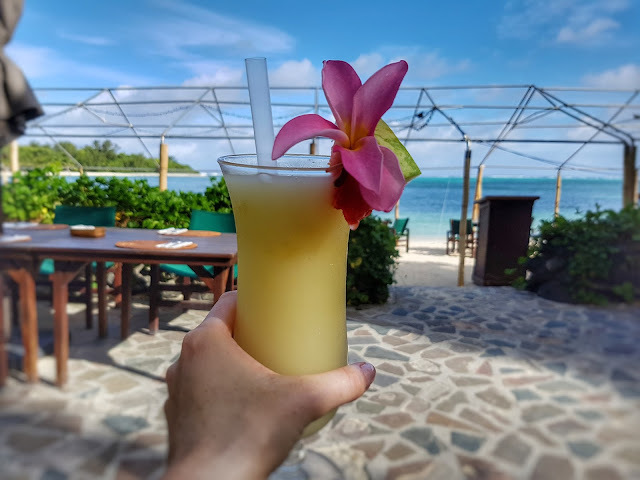 The staff at the Pacific Resort always went out of their way for any minor request, their service was impeccable and I have now written a glowing review of my stay and wedding there if you’re interested. Their genuine friendliness and kindness made our week there all the more better. 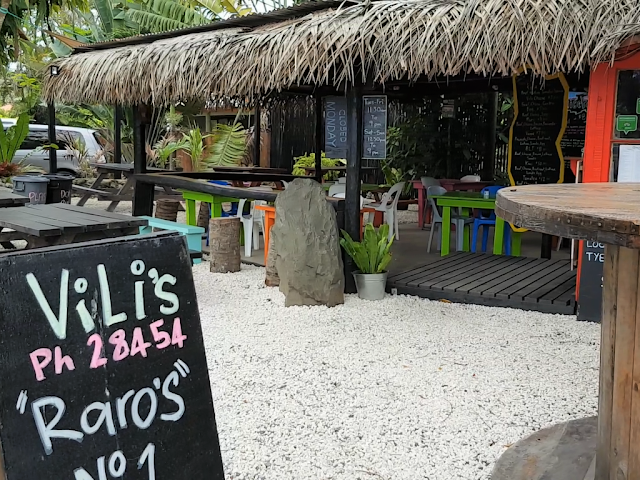 Just down the road from the Pacific Resort in the heart of Muri is Vili’s! 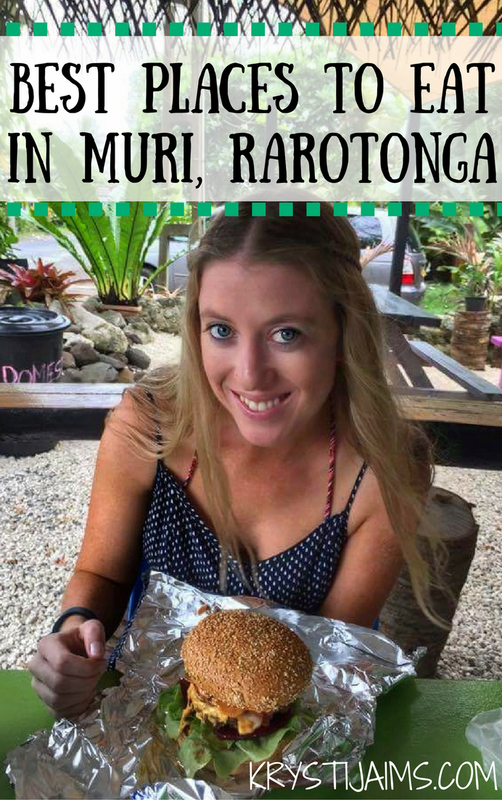 We heard numerous times from locals that this place has the best burgers on the island and is “the McDonalds of Rarotonga”- quoted by my wedding coordinator! I didn’t get a chance to eat there until Friday, the day after the wedding and we went there for breakfast/brunch. 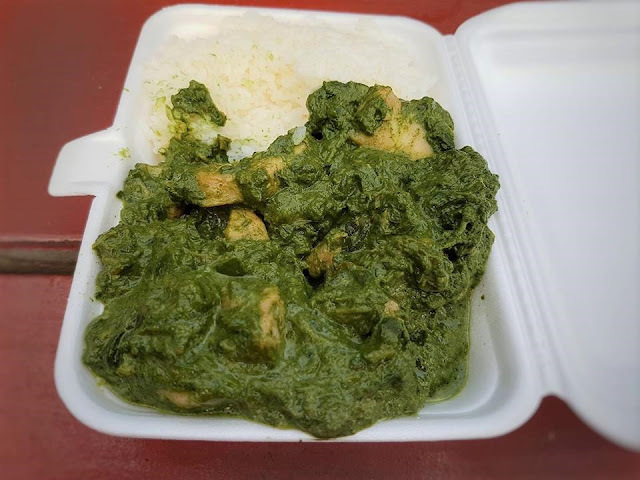 (Gareth – now husband – ate there three days in a row). 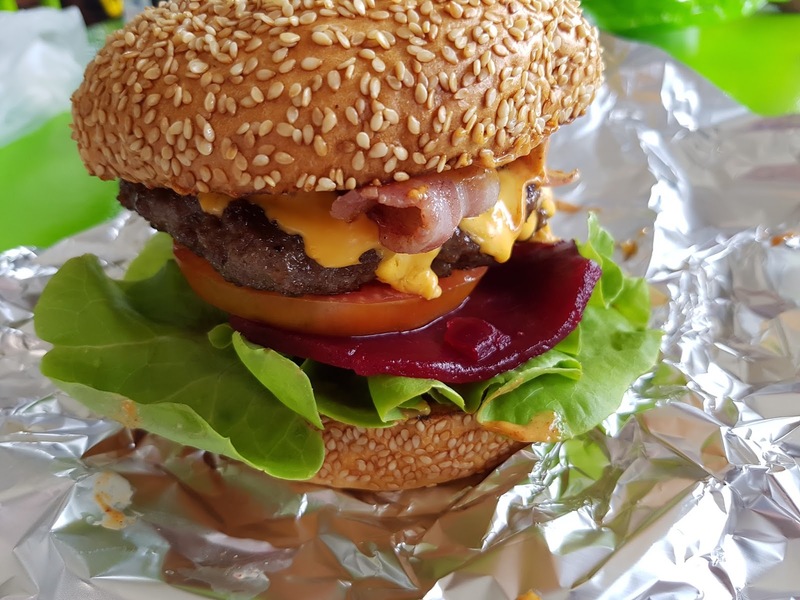 There is a good range of burger choices available – I chose the ‘Tamatoa’ for $13 NZD which had a beef patty, bacon, egg, cheese, beetroot, tomato, lettuce and their special secret sauce. It was absolutely massive! Definitely the biggest burger I’ve ever had (I’ve never been to America) and it was also the best! It was so juicy it was literally dripping down my arm (so attractive). I ate almost the whole thing and it certainly kept me full until dinner time – it was just incredible. I had the same thing again the next day for lunch – except I went halves with my bestie cause I definitely couldn’t eat a whole one again. 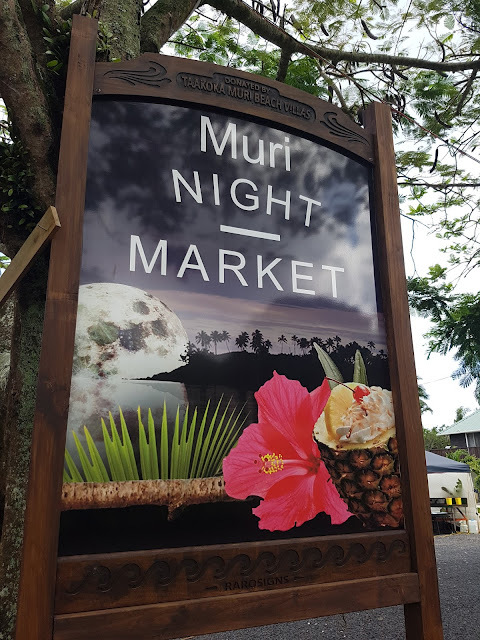 Highly recommended if you’re in Muri and you like your burgers. They are open from 11:30 am – 9 pm every day except Mondays. 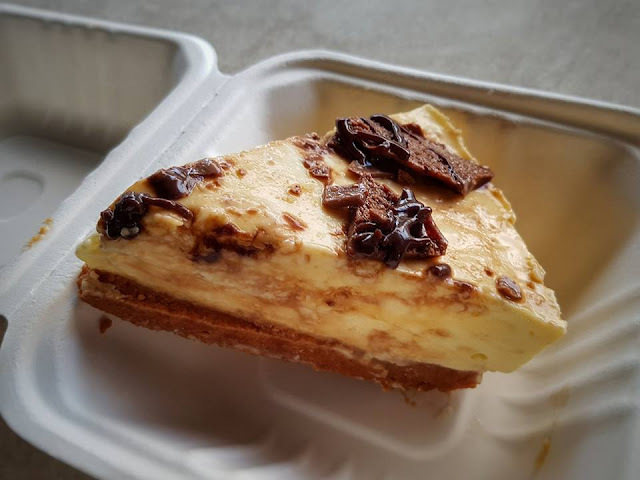 The second time we shared a chicken rukau with rice (a local dish – leaves of taro – similar to spinach) and finished with a crunchie cheesecake. Everything was so good! The markets start from 5:30 pm so get in quick if you want something in particular – the most popular foods get sold out pretty quick! 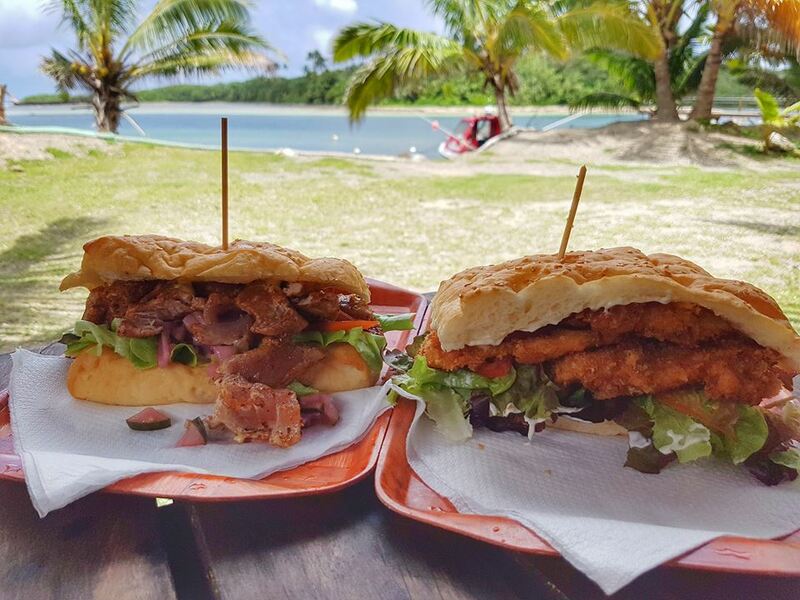 Another place we had heard from two different locals for the “best fish sandwiches on the island” was The Mooring Fish Cafe. We saw it was only a 15-minute walk from the Pacific Resort so we ventured there for lunch on our final day. It’s an outdoor cafe where you sit at picnic tables and enjoy the lagoon view. As it was a Sunday it was full of local people all dressed up in their Sunday-best, they had clearly just come for lunch after church. There were some great choices on the menu – too many so we asked what they would recommend. The lady said the most popular was the ‘FOB’ or the Hot & Spicy if you liked spicy food – which we did, so we got one of each to share and also a fresh baby coconut. They were so fresh and tasty and I really enjoyed both – but I think my favourite was the FOB. The batter on the Mahi was so crispy and the lime mayo with it topped it all off. We had lunch there on our first day – we both just felt like a sandwich and we saw a tomato and cheese baguette in their cabinet. We ordered one each and it came served to us cut in half with a nice bowl of chutney on the side. The sandwiches were huge and very fresh and tasty – which we were glad for at $9 each. I had also pre-arranged catering through them for my ‘Hens Day’ and they did a fantastic job for that. I ordered a cheese and deli platter, a bakery/sweets platter and a fresh fruit one. There was so much food that arrived (they delivered it free of charge) and it came in a small portable fridge for it to stay cold and fresh. The bakery sweets were amazing, the cheese platter came with plenty of fresh bread and crackers, there were prawns wrapped in prosciutto – I totally over ordered for 11 people but everyone enjoyed as much as they could. (The photo below was only half the amount!). 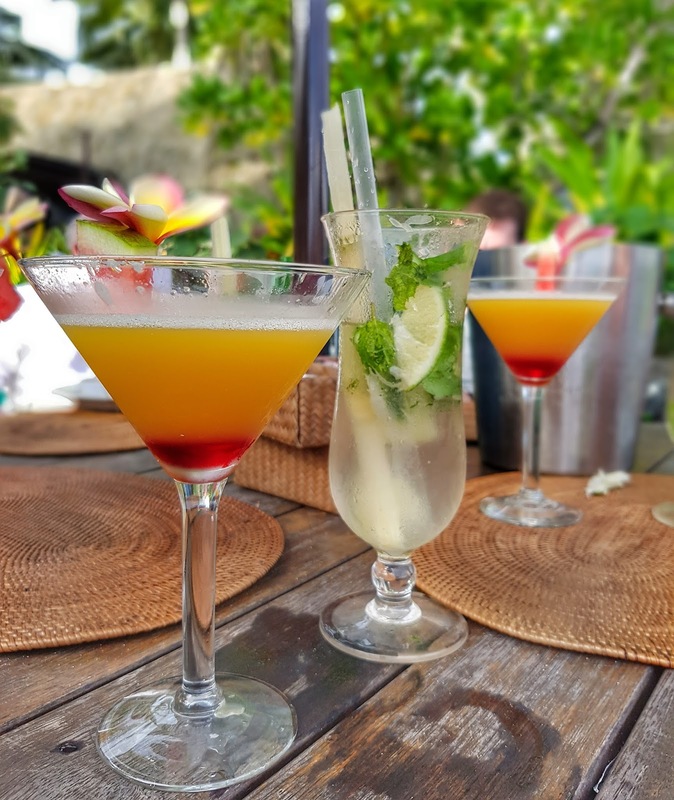 Sails Restaurant & Bar is located on Muri beach where you can enjoy excellent views of the lagoon. 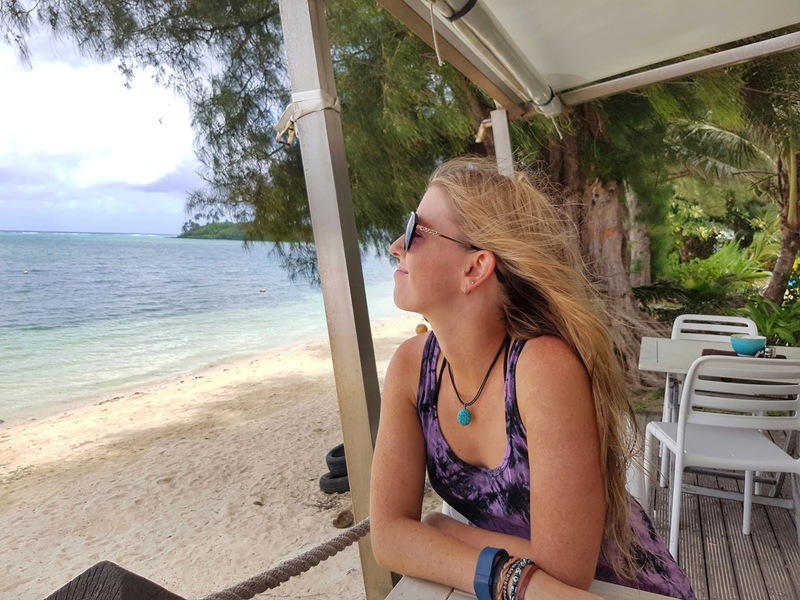 The first time I went there for lunch I didn’t even bother looking at the menu – because right outside was a line of locals and tourists alike lining up for a spit roast pork roll. The roasted pig was right there with the guy carving for each person and rows and rows of hot dog sized rolls pre-filled with butter and coleslaw – I thought it was like a Rarotongan styled sausage sizzle! I knew Gareth would have loved it too (he was with his friends), so the next day we went back hoping for another one. I’m not sure if it was a Tuesday only or just a random thing because it wasn’t there again. No matter – I got to actually look at their menu this time and I ordered pulled pork soft tacos and Gareth got crispy calamari and a side of chips. We saw they have regular live sports on their big screen TV and there was an All Blacks game playing the next morning – but we were a bit too busy to go. The total was $38 including a soft drink each – so a bit pricey, but not too bad for $19 each for a good lunch. The service was great and the food too. I really enjoyed the food in Rarotonga – it was always fresh, delicious, decent prices and huge portions, and the people are so friendly which means great service. Coming up next is my Travel Diary from my week there which I’ll be posting before I’m off again to Vietnam which is in four days.